How do I connect to an AWS instance? This lesson covers how to log into, and out of, an already running Amazon instance. Setting up a new AWS instance requires a credit card, an AWS account, and up to a day of verification time, but you’ve already spent most of this workshop working in the cloud! To save time, your instructor launched a remote computer (instance) for you prior to the workshop, and connected it to our lesson data. You’ve already logged into it at least once, but now that you’re more comfortable with the command line, lets go back and talk about how it all works. We have a pre-configured copy of the data needed for this workshop that is always available to attach to a new instance on Amazon, as long as you have an account, and the log-in credentials to open it. To access the pre-configured workshop data, you’ll need to use our log-in credentials (user name and password). These credentials will be supplied by your instructor. But first, you need a place to log into! To find the instance that’s attached to that data, you’ll need something called an IP address. Your instructor should have given this to you at the beginning of the workshop. Recall that cloud computing is about choice. You can rent just a single processor on a large computer for a small project, or you can rent hundreds of processors spread across multiple computers for a large project. In either case, once you rent the collection of processors, Amazon will present your rental to you as if it was a single computer. So, the physical computers that host your instances don’t really move, but every time you launch a new instance, it will have a new IP address. So, each time you launch a new instance, the IP address changes, but your Log-in Credentials don’t have to. We will use a protocol called Secure Shell (SSH) that, as the name implies, provides you with a secure way to use a shell. In our case, the shell will be running on a remote machine. This protocol is available for every operating system, but sometimes requires additional software. 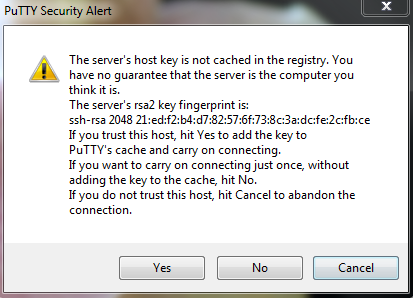 Prerequisites: You must have an SSH client. There are several free options but you should have installed PuTTY.exe at the begining of the workshop, and we’re going to continue using that. Mac and Linux operating systems will already have terminals installed. The authenticity of host 'ec2-52-91-14-206.compute-1.amazonaws.com (52.91.14.206)' can't be established. ECDSA key fingerprint is SHA256:S2mMV8mCThjJHm0sUmK2iOE5DBqs8HiJr6pL3x/XxkI. Note: When typing your password, it is common in Unix/Linux not see any asterisks (e.g. ****) or moving cursors. Just continue typing. Logging off your instance is a lot like logging out of your local computer: it stops any processes that are currently running, but doesn’t shut the computer off. AWS instances acrue charges whenever they are running, even if you are logged off. If you are completely done with your AWS instance, you will need to terminate it after you log off. Instructions for terminating an instance are here: launching cloud instances on your own. Internet connections can be slow or unstable. If you’re just browsing the internet, that means you have reload pages, or wait for pictures to load. When you’re working in cloud, that means you’ll sometimes be suddenly disconnected from your instance when you weren’t expecting it. Even on the best internet connections, your signal will occasionally drop, so it’s good to know the above SSH steps, and be able to log into AWS without looking up the instructions each time. In the next section, we’ll also show you some programs that you can use to keep your processes going even if your connection drops. But for now, just practice logging on and off a few times.